Average Weight	: 22 - 24 lbs. The first traces of a dog similar to the Basenji are found in Egyptian tombs and wall drawings of five thousand years ago. Also called the Congo Dog, it was first introduced to England in 1937. English breeders refined it and exported it all over the world. The Basenji is probably one of the oldest breeds of domesticated dog, and perhaps that's why he's not a barker. Early people may have preferred a quiet dog on hunts. Like his wild cousin the wolf, the Basenji can bark but usually barks only once and then is silent. It's also theorized that he is only partially domesticated. His metabolism is unlike that of any other domesticated dog, and like wild canids the female Basenji only cycles once a year compared to twice a year for other domesticated dogs. 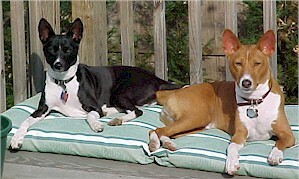 Basenjis were discovered by Westerners in the Congo region of West Africa in the 19th century. There, the dogs were used to flush game into nets, to carry goods, and to warn of the approach of dangerous animals when on the trail. A good hunting Basenji was valued more than a wife by some tribes in Africa, not only for his hunting skill but also his resourcefulness and ingenuity. •	Highly Intelligent, can be a great 'con artist' with their owners. •	Good companion dog ~ but you gotta stay 'one step' ahead of them! •	Can be very 'stubborn'. "Willing To Please" is not in this breed's vocabulary. •	They love to chew and eat ~ so keep whatever you value off the ground, and out of sight. •	While thought to be 'barkless' this breed has an interesting 'yodel'. •	Love to play, but not 'fetch'. •	Shed very little ~ a fairly great choice for those that suffer with allergies. •	Excellent watchdog. Courageous ~ would make a great Guard Dog if not for their 'smaller' body size. •	Love to 'lure course' if given the opportunity.....these are sight hounds after all. •	Not a breed for everyone. •	Can be difficult to train, due to their stubbornness. •	Strong prey drive, cannot be trusted 'off-leash'. •	Not great in homes with smaller pets.